Georgian Lynn glass with "lynn moulding" or "lynn rings" takes its name from the Kings Lynn area where it was presumed to have been made. “Lynn Glass” is a colloquial name, much used throughout the glass collecting community for a generic and simple form of Georgian glassware, which bears common horizontal banding. A basic and easily-applied form of decoration, the bands – to come under this nominal Lynn remit – do not have to conform to any particular configuration in either width, number or spacing which should - quite rightly - cast some aspersions as to the veracity of the name for a specifically manufactured genre. It is not surprising to learn, therefore, that there is little or no provenance behind the general assumption that Lynn Glass was made only in or around Kings Lynn (formerly Lynne Regis or just Lynne) in Norfolk, East Anglia. There is simply no historical record of a glassmaking industry in the area that had the capacity to turn out a sufficient number of pieces to warrant its own abiding toponym. However, there is documentation to establish the use of the name in a broader context, as we shall see. Lynne’s glassmaking commerce was restricted to just one or two production facilities operating from the very late 17th century under the auspices of Messrs Jackson and Straw, following on from Isaac Harrison’s earlier bottle glass house. There are several depositions on record from these gentlemen to their local MP’s appealing for a reduction in glass tax, as the consequent price rises of their products restricted sales and threatened the viability of the operation, which provided a significant source of employment for the townsfolk. These remonstrations fell on deaf ears, and the trade remained hampered by the imposition of the taxation for its entire duration, something which also mitigated against the broader expansion of the glassmaking business in the area. The reason for the initial establishment of the, albeit small, trade in the area brings us to the origins of the name in its current usage. Industry has always sought to locate itself favourably, and in this instance it was the presence of extremely high quality glassmaking sand that prompted its foundation. Easily found just to the east of Lynne, near Dersingham, the sand was noted as being one of the town’s most significant exports – most significantly in the quite splendidly entitled Penny Cyclopaedia of the Society for the Diffusion of Useful Knowledge; Vol 13-14 (1838) which includes a lengthy piece about every aspect of Lynne, it's topography, industries and so on, making specific reference to the export of fine sand - but with no mention at all of a locally based manufacturing industry, something which would undoubtedly have been documented had it been extant. The sand most fit for making white, transparent glass is that brought from Lynn in Norfolk, by the name of which place it is distinguished. And there you have it – contemporary affirmation that Lynn glass was a term applied to any wares manufactured using the sand from the area, entirely regardless of where the pieces may have actually been produced. 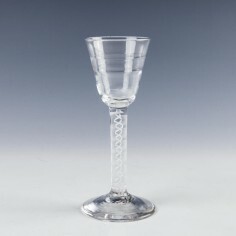 The commonality of the banded decorations is clearly based on little more than its application being a popular and straightforward way in which to augment the high quality Lynn-sand glassware, which might have been a more appropriate name for the pieces and avoided the later misconception as to its source.